There’s a narrative at work in The Brought Low’s best songs, chronicling existence in the inner-cities outer boroughs and the pratfalls of hard work, hard liquor and hard time. The essence of these stories mirror the band’s own: the past couple years has been a repetition of arrivals and departures: family dying and being born, band members entering in and then walking out. There was a local new wave revival whose aesthetic they couldn’t have less to do with, a cycle of touring, working, and touring again, a decrepit practice space that’s become a decrepit second home. On the other side of the tunnel they’ve come out stronger, more resolute in their conviction, and wired for maximum impact. since the rolling thunder of their NYC debut in 1999. The band’s universally-lauded self-titled debut album on Tee Pee Records earned them a loyal audience, and the howling overdrive of their impassioned live shows have become the stuff of city folklore. 2003 saw the addition of bassist R o b e rt Russell as well as second guitarist Kevin Eleven, who left the band shortly after recording concluded, returning them to their original power trio format. 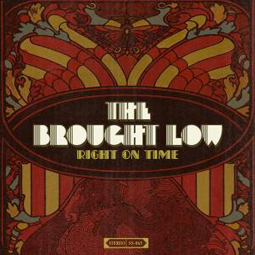 Following the release of Right On Time, The Brought Low band has planned a series of guerilla tours throughout the country that will carry them well into 2007.